There would be no way that I could love Tyra Banks any more than I do. I don’t know if she knows how insane she is and I love me some crazies. 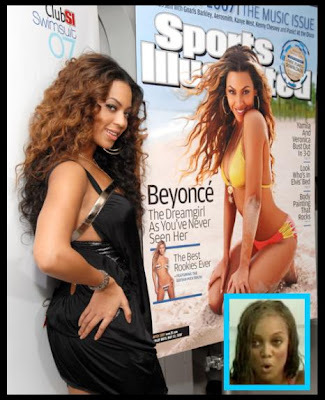 What better way to celebrate Beyonce making the cover of Sports Illustrated Swimsuit Edition than to have Tyra make it all about her and toss on the bikini that she wore on the cover from 10 years ago. Great idea! Way to make it all about you! I have to admit that Tyra still looks good in that bikini, although they did have to add some extra material to the bikini since Tyra admits she’s about 20 pounds heavier than 10 years ago when she wore it last. Ok Tyra we get it. You’ve gained a little weight. Fine. We get it. You like to put on old bathing suits that you were photographed in. We get it. You want people to stop saying your fat. We get it. However, it’s either going to be fat or crazy. Now I never thought you were fat, but I’ve always thought you were a little crazy, but in a good way. You know, the way that you see that one lady talking to herself as she crosses the street and you assume she’s on her cell phone…but she isn’t. She doesn’t even have that bluetooth thing. She’s just talking to herself. You want to know what she’s saying, but you can’t really make out the mumbles. Then she smiles…to herself. Then she continues talking to herself. Yeah, you’re kinda like her. Check out more of Tyra in her 10 year old bikini on a very special Monday episode of the Tyra Banks Show. Check your local listings. I’m not going to do it for you. Tyra Banks is the American Dream?